J.O.A. 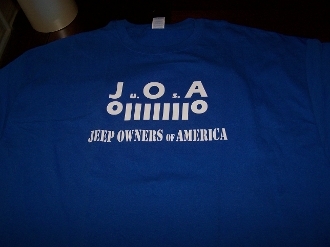 JEEP OWNERS OF AMERICA T-SHIRT CHOOSE SIZE AND COLOR. THE FULL COLOR CHART IS FOR THE SHIRT COLOR AND THE LOGO COLOR CHART IS FOR THE LETTERING.